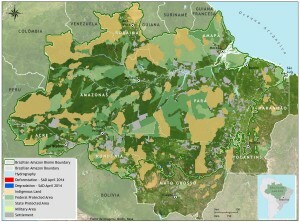 With 59% of cloud cover, SAD detected 101 square kilometers of deforestation in the Brazilian Amazon. Fonseca, A., Martins, H., Souza Jr., C., Sales, M., & Veríssimo, A. 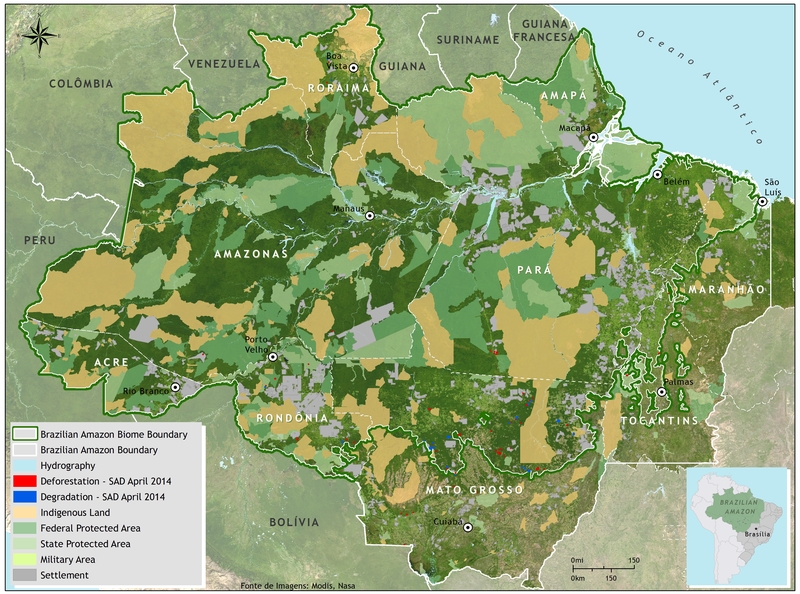 2014. . Forest Transparency for the Brazilian Amazon (april 2014) (p. 10). Belém: Imazon. In April 2014 the majority (59%) of the forest area of the Brazilian Amazon was covered by clouds, a cover superior to that of April 2013 (55%), which reduced the capacity for detecting deforestation and forest degradation in the region. The States with the greatest cloud cover were Amapá (91%), Roraima (80%) and Pará (76%). The State of Mato Grosso presented a low cloud cover (12%), making it possible to detect deforestation and forest degradation in areas that were under cloud cover in previous months. During the period analyzed, and under those cloud conditions, 101 square kilometers of deforestation in the Brazilian Amazon were detected by SAD. That represents a 28% decrease in relation to April 2013 when deforestation totaled 140 square kilometers. The deforestation accumulated during the period of August 2013 to April 2014, corresponding to the first nine months of the current deforestation calendar, totaled 662 square kilometers. There was a 58% reduction in accumulated deforestation in relation to the previous period (August 2012 to April 2013) when deforestation totaled 1,570 square kilometers. Degraded forests totaled 189 square kilometers in April 2014. In relation to April 2013, when forest degradation totaled 9 square kilometers, there was an increase of 1980%. The great majority (92%) occurred in Mato Grosso, followed by Rondônia (7%) and Roraima (1%). Forest degradation accumulated during the period of August 2013 to April 2014 totaled 407 square kilometers. There was a 67% reduction in relation to the previous period (August 2012 to April 2013) when forest degradation totaled 1,219 square kilometers.